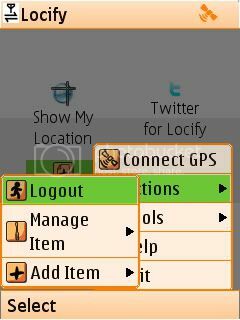 This is basic service for every Locify user. It enables you to save your current location locally, synchronize your locations with our server and browse saved locations on our server. Updating your status on Twitter has never been simpler. This service allows you to send and receive Twitter status updates. Ever wanted to know everything about place you’re visiting? Now you can – find Wikipedia articles about nearest places. This service allows you to show and update your location on FireEagle. Are you geocacher? This service is made for you! You can view nearest geocaches around you, view their terrain, difficulty etc.. Then you can save them locally or navigate to them! Geocaching was never easier! Odkrite podjetja v vaÅ¡i bliÅ¾ini. Restavracije, trgovine, bari, hoteli, storitve,… Na voljo le v Sloveniji. This service allows you to find nearest open caches on opencaching.cz and opencaching.pl servers. You can view description and decrypted hint of these caches, navigate to them or save them locally. Show your favourite places. Now even on your mobile phone. Eventful service allows you to find nearest events and venues from eventful.com and show their description. Then you can navigate to them, if event or venue have GPS coordinates..
Upcoming service allows you to find nearest events and venues from Upcoming. Zvents – Discover Things To Do. With Locify you can find nearest events, show their details and navigate to venue. Explore current and future weather around your location with Accuweather.com! OdeÅ¡lete prÃ¡telÅ¯m krÃ¡tkÃ½ email a k nÄ›mu bude automaticky pÅ™idÃ¡n odkaz, kde se prÃ¡vÄ› nachÃ¡zÃ­te! Send a short email to your friends, links to your actual position will be automatically added! If you receive “Authentication error” or similar, you need to install Thawte root certificate – Download certificate.